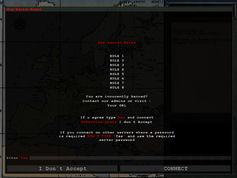 StoerFaktoR created a little addon, which forces players to accept the serverrules before playing on a server. The show is now really over. Wolfmap closed down, a godfather of ET sites have gone. Thanks to the admin team for all the great years! I`ve actually received the news-history from Wolfmap. After a little coding work, I present you the Wolfmap news archive, with fixed download-links. A first release of ETNam Mod is in the wild.